Brayton Finch was a dual threat at Martin Luther. 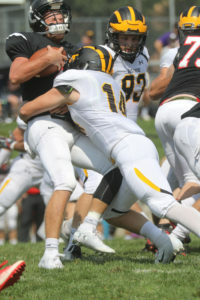 NEW ULM, Minn. – It took some time for the Gustavus football team to find its footing Saturday in the season opener at Martin Luther College, but after trailing by two at halftime the Gusties made the necessary adjustments to outscore the Knights 14-0 in the final 30 minutes and came out on top 32-20. Jake Boykin makes a tackle in the backfield. 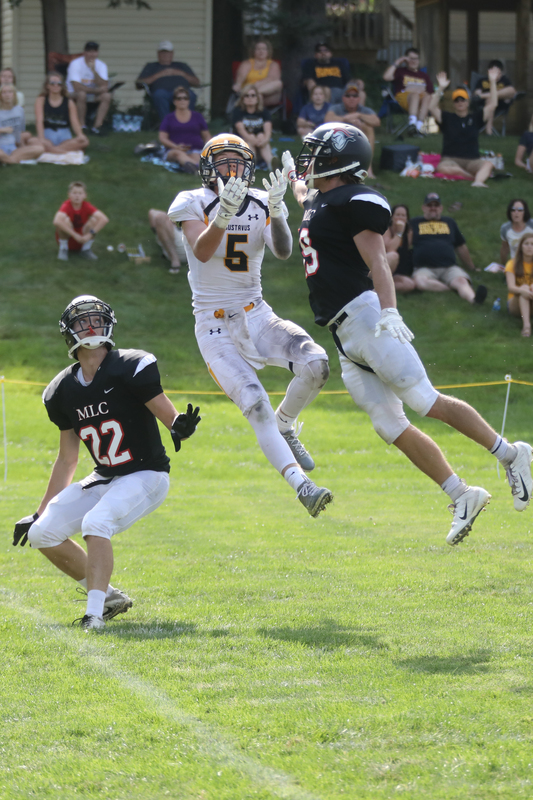 Martin Luther established its rushing game with 223 yards on the ground, but the Gustie defense limited the Knights to 84 yards through the air. Conversely, the Gusties had more success in the passing game with 248 yards compared to 106 yards on the ground for a total of 354 yards. On the first play from scrimmage, the Gustie defense forced and recovered a fumble, which turned into six points four plays later on a three-yard rushing touchdown by Brayton Finch (Jr., Mount Morris, Ill.). But the majority of the first half belonged to the home team as it responded with three touchdowns over its next six drives. A 70-yard scoring drive gave MLC a 7-6 lead with 11:47 left in the first quarter. The Knights increased their lead to 13-6 on their next possession with a 10-play, 65-yard drive. 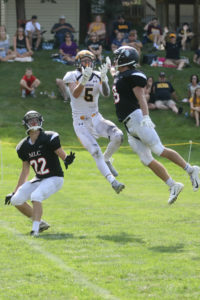 Early in the second quarter, Gustavus brought the score within one after a seven-play 67-yard drive, capped by a Michael Veldman (Sr., Becker, Minn.) to Hunter O’Bert (So., Eden Prairie, Minn.) two-yard touchdown pass. But the Knights answered right back by recovering a muffed punt and driving 23 yards in six plays to increase their lead to 20-12 with 2:27 left in the half. 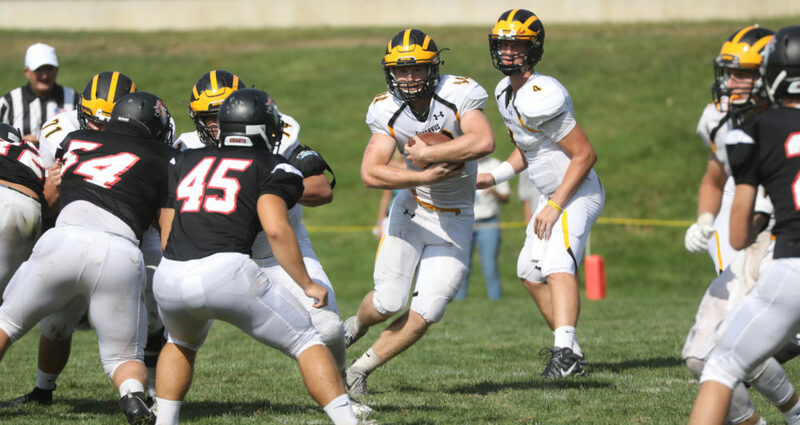 The Gusties were able to put together a nine-play, 66-yard scoring drive on their last possession of the half as Veldman connected with Finch on a four-yard strike to make the score 20-18 at halftime. After trading three-and-outs to start the third quarter, Gustavus got the ball back at the Martin Luther 20 ensuing a six-yard punt. On the next play, Veldman once again found Finch, this time down the left side for a 20-yard touchdown. The scoring play gave the Black and Gold a lead they would not relinquish. Brice Panning eyes a sideline pass, which he hauled in between two defenders. After the Finch touchdown, the Knights had four more possessions, but each ended with Gustavus getting the ball back. Late in the third quarter, Veldman capped a six-play, 82-yard drive by lowering his shoulder for a six-yard touchdown run, making the score 32-20 which would stand for the remainder of the game. Martin Luther had 48 offensive plays in the second half, but the Gustie defense did not allow a score in the final 30 minutes. The Knights saw some success on third down, converting 11-of-23 chances along with 3-of-7 fourth downs. Gustavus was 5-for-10 on third down. Veldman finished the day completing 20-of-35 passes for 248 yards and three touchdowns along with running one across the goal stripe. Brice Panning (Jr., Hamburg, Minn.) was his top target with seven catches for 143 yards and a long of 43. Finch had a productive day both on the ground and in the aerial attack with 13 carries for 57 yards and a touchdown along with four receptions for 43 yards and two scores. Matt Berkner (Sr., Sleepy Eye, Minn.) led the defense with 11 tackles. Gustavus hosts UW-Stout next Saturday at 1 p.m. for its home opener at Hollingsworth Field. The Blue Devils lost at Saint John’s today 27-0.